In this business world, what prevailing is, as day- by-day many businesses getting started are all generally software-driven, applications placed at the heart of the business implementation. 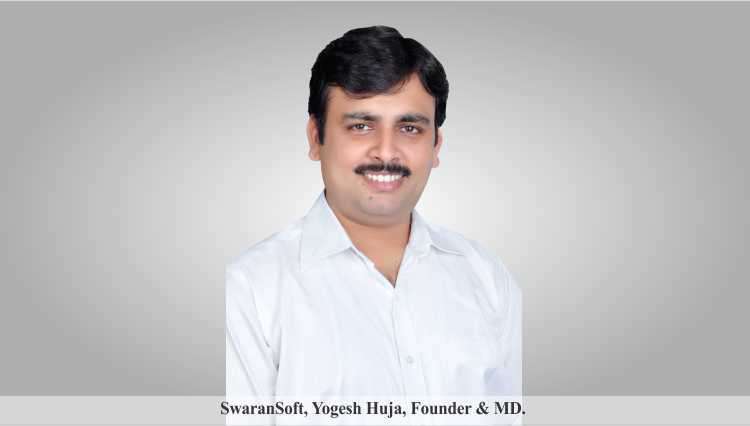 SwaranSoft is one of the leaders in IT solutions, Mobile applications & services in India, Founded a decade ago by Mr.Yogesh Huja. He has more than 14 tremendous years of experience in entrepreneurship. Under his stature the company has grown leaps and bounds to the position of trust and respect from its valued customers. He has undergone various programs at IIT Kanpur & Mumbai on Future of Computing as well as Data Warehouse Implementation and his areas of specialization are Consulting, Development, Large Database Management, Distributed Systems and Server Systems. SwaranSoft work on web, mobile & digital marketing assignments. Company’s dominance inhere in successful case studies for corporates like Honda, Konica Minolta & more in managing Partner Channel, Schemes, Claims, Digital Asset Management. The company firmly put confidence in smart solutions that provide automation, By playing a role of a partner, they provide growth to their client’s business is the key goal of SwaranSoft. Yogesh Huja says, “Entrepreneurship is way to think & strength to take responsibility”. He wanted to create a place where smart people think, collaborate, innovate and convert the ideas into action. Some people’s mind set tends to think that win-win or no deal, But we believe in excellence with self-honesty to admit when we are wrong and have the courage to change the same. To stay ahead in the competition SwaranSoft’s modus operandi is that one needs to keep measuring & things which are measurable are manageable. The team aims to keep evolving through leadership, innovative thoughts, and business tools that are most up-to-date. They have invested in time and tools related to iBeacons technology, In today’s scenario very users expect a qualitative highly personal experience whenever they are interacting with the applications. Mobile apps integrated with iBeacons proves to be fruitful in future and in order to be a cutting edge performer and foster growth, you need to be boosted by a technology provider on which you can rely on. This is where their role comes into action. The initial roadblocks were to get reputed customers & brands in kitty. They made an entry with a very less amount order with Bausch & Lomb in 2003 & today they have sustained list of brands like Honda, Konica Minolta, NGK, DMRC, Indian Railways, Panasonic & more. Yogesh feels that establishment was not an issue; consistently running was though a challenge. His 14 years practice have proven to be a great ground for learning that he got confidence for writing a book on entrepreneurship. SwaranSoft team is deliberately working on future concepts like local social discovery, wallets, feet on street tracking, iBeacons technology & more related to mobile app development. Their roadmap brings exciting products for enterprises & social commerce. Living up to the worthy principle stating “End to End Services & Solutions” to meet diversified customer’s needs. Yogesh also conveyed that “Carrying out business with transparency & quality” phrases our code of conduct.